For the first time in three years, I was home for St. Patricks Day. 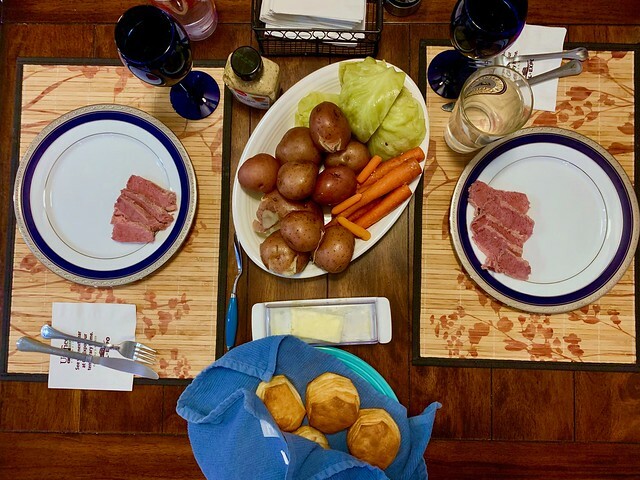 Sure, it’s not a “major holiday” and we don’t do anything special other than cook the “traditional” dinner of corned beef and cabbage. But, it’s been three years since I have made this on St. Patrick’s Day. Earlier in the day, we met my aunt and uncle for brunch. I hadn’t seen them in quite some time. They were visiting Sacramento as a weekend getaway and I’m happy we had a chance to catch up. I had corned beef hash for breakfast, completely forgetting that we had this dinner planned for later. So I had a day of corned beef and I should basically check my arteries, cholesterol, and the rest of my vitals.